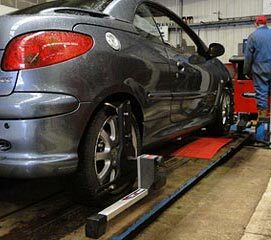 Accurate and extremely durable, the Supertracker Wheel Aligner is an important part of any vehicle servicing set up for 4 wheel alignment. The Measuring heads have an integrated control pad plus built in electronic spirit level. An 8 sensor measuring system using CCD technology. Designed using the latest static type of transducers and inclinometers, this alignment system gives greater durability and precision. The benefits of regular wheel alignment speak for themselves, reduced uneven tyre wear, improved handling of your vehicle (no pulling to one side for example) as well as save you money by lowering fuel consumption, and a less uneven tyre ware. As you would expect from such an advanced wheel alignment system, we have an extensive vehicle database with up to date settings for all modern vehicles. We can do a full history recall of your vehicle if you have been before from the systems database, with colour print out showing before and after readings. 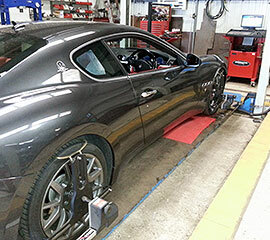 Our technicians have assistance of full help screens on a variety of vehicle adjustments. 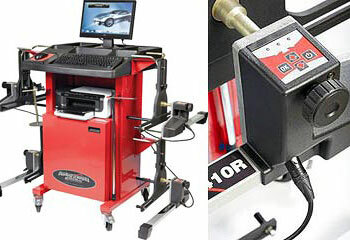 Inclined measuring head spoiler programme, VAG and Mercedes programmes, is also available within the software. So, if you live within Fife, particularly in the Glenrothes area and need your vehicles tracking and wheel alignment checking, give us a call.